For 2019-20, CKCA managed grant programs are focused on arts & culture support. Heritage organizations that were previously supported through CKCA programming are directed to contact the Trust, who provide funding support to protect heritage assets and support heritage, museum and archive work throughout the region in partnership with Heritage BC. You can learn more about these programs at ourtrust.org/heritage. All funding programs delivered by the CKCA are funded by the Trust. Read the current CKCA 2019-20 Arts & Culture Funding Programs Brochure to decide which program best fits your project idea. To be eligible for CKCA funding, the primary emphasis of project proposals must be arts & culture. Projects cannot occur until June 1, 2019. Not all project ideas will necessarily be eligible for funding. Read the 2019-20 Primary Funding Policies and Guidelines. This document outlines general policies and guidelines applicable to all CKCA funding programs. Review the policies and guidelines / application for the program you are interested in (scroll down the page for links). 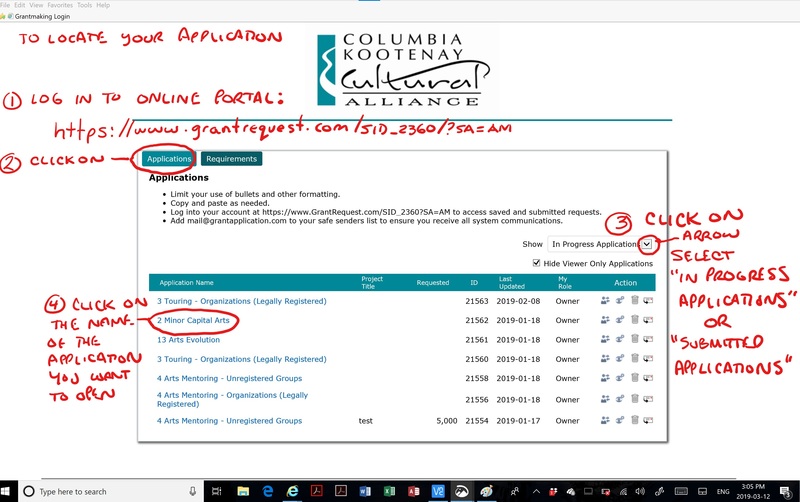 Applications are now in an online application format for all programs except Arts Funding to Communities, which is available in Adobe PDF format below. Click here for the CKCA Online Application Guide. If you have any questions, please look at the FAQ page. If your question is not answered there, please contact the CKCA office for assistance. Complete the application form for the program you wish to apply for. Application forms must be submitted online except for Arts Funding to Communities, which must be submitted as a paper form. All applications (hard copy and online) must be submitted before the application deadline for that program. Late or incomplete applications will not be funded. Applications will only be accepted as outlined under “Deadlines”; fax or e-mail applications will not be accepted. Applications will only be accepted before the applicable funding deadline by the methods outlined below. Arts Funding for Communities applications are sent directly to a local community arts council in hard copy. All remaining program applications are submitted online through the CKCA website / online application portal. Applications must be submitted before the applicable funding deadline. Click HERE for the CKCA Online Application Guide. Major Project Arts program applications are submitted online through the CKCA website / online application portal, with the portfolio submitted in hard copy: by mail through the CKCA post office box; by courier service to the CKCA office. To facilitate fairness and equitable access to funding, hand delivered portfolios dropped off at the CKCA will not be reviewed. ArtStarts Creative Spark has different application deadlines and applications are submitted to ArtStarts in Schools. IMPORTANT! Read the Online Application Guide before starting an online application. DO NOT use your browser (Chrome, Safari, Firefox, Edge etc.) to edit fillable PDF forms – use Acrobat Reader only or your edits will not save. More details are in the guide. *If using the Fillable PDF application form, read the following section of the ONLINE APPLICATION GUIDE: “Attachments, Budget Forms” pg 5-8 for fillable PDF instructions before using the form. Mail the document to the Columbia Kootenay Cultural Alliance, or scan the document and email the attachment to: wkracassistant@telus.net. Ensure you put your file number and the type of document in the “subject” line.